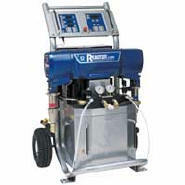 The Graco A20 is a cost effective, high-performance, air-driven spray foam proportioner. Great for residential foam insulation spraying. Longer life and improved reliability. Heats material quickly with 6,000 watts of heat - provides accurate heat control for reliable spraying in colder environments. No transformer taps to change. Automatically powers up to 310 feet of hose. Jumpers provided to easily adapt to different electrical supply voltages. Primary and hose heat circuit shutdown with resettable switches. Increased airflow to air motor improves efficiency and increases output. Recirculates TSL (Throat Seal Liquid) around the ISO pump seal. Prevents ISO from forming hard crystals on the pump rods. Basic unit includes inlet strainers, ball valves, air filter/water separator, and fluid temperature sensor for whip hose. Click on image to view A20 Parts ID Manual. Install your Graco A-20 into a mobile spray unit.